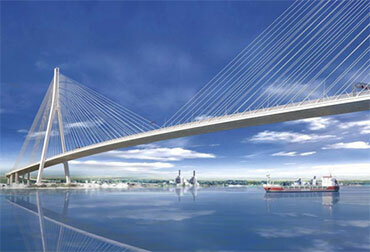 The Gordie Howe International Bridge, when completed, will be a cable-stayed bridge spanning the Detroit River and joining Windsor and Detroit. The bridge will be a border crossing between the United States and Canada, and will connect the major freeways of I-75 and I-96 in the United States to the new 401 expansion The Rt. Hon. Herb Gray Parkway in Ontario. With 25% of the trade between the US and Canada occurring at the Detroit/Windsor border crossing, the Gordie Howe bridge is seen as a necessary investment in the future. The Gordie Howe International Bridge project also includes border control spaces in both Windsor and Detroit, with the Canadian port of entry spanning 130 acres, as well including a design to include a multi-use path for pedestrians and cyclists. The bridge construction will be funded largely by the Canadian Government, with an estimated cost of $3.8 billion dollars. Once completed, the Canadian Government will collect all toll revenues. The construction project is expected to bring 2500 jobs to the Windsor area. The naming of the bridge is symbolic of hockey player Gordie Howe having come from Canada to spend his NHL career in Detroit. The project began as the Detroit River International Crossing (DRIC) in 2004, but several controversies delayed the project. While the owner of the Ambassador Bridge, Manuel Maroun launched suits against the Canadian and Michigan governments, his attempts to block the building of the Gordie Howe Bridge were unsuccessful. In a joint statement released after a meeting between U.S. president Donald Trump and Canadian Prime Minister Justin Trudeau on February 13, 2017, the two governments reiterated the support of the “expeditious completion” of the project. Construction is expected to be underway in the spring of 2019, with a projected completion date of 2024.